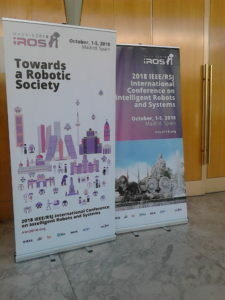 Fanta Camara interACT’s partner from ITS Leeds participated in the 2018 IEEE/RSJ International Conference on Intelligent Robots and Systems that took place in Madrid, Spain on 1-5th October, 2018 through a poster session. More than 300 people participated in the conference and about 50 people attended Fanta Camara’s short presentation concerning the poster entitled ‘ Towards pedestrian-AV interaction: method for elucidating pedestrian preferences’ which presents a new empirical protocol based on tracking real humans in a controlled lab environment. This protocol, is able to make inferences about the human’s preferences for interaction.